Bacopa, also known as Brahmi, is a plant native to India and Sri Lanka. In Sanskrit, Brahmi means, “expands consciousness” which is really fitting for a plant that has been used for many centuries as a brain-booster! Studies show that Bacopa has the ability to promote the regeneration of brain tissue and support healthy neuron communication by increasing the growth of nerve endings. This allows you to experience sharper brain function, increased attention span and improved problem-solving abilities. 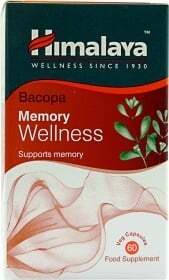 Bacopa has also been shown to increase the number of GABA receptors, which helps calm and soothe your brain and promote inner peace and relaxation at the same time. It’s time for you to defeat mental stress and bring back your sharp thinking abilities. Sharpen your mental abilities the natural way with Himalaya Bacopa! Have a question about Bacopa (Brahmi)? What is it, what does it do, how and when to use or something else? Ask us. Take one capsule twice daily after food. WARNINGS Bacopa (Brahmi) : These statements have not been evaluated by the FDA. These products are not intended to diagnose, treat, cure or prevent any disease.